Draka has invested in innovation to make sure all it’s cable products meet the requirements of the latest fire cable performance standards and produces a range of products to meet the needs of modern building and structures. Firetuf Cable – fire resistant cable which provides fire cable performance with low smoke and zero halogen properties for fire alarm systems. Saffire Cable – zero halogen, low smoke cables for safety during fire, especially the safety of the public in buildings, shopping centres, hospitals, schools, underground stations and airports. Wiring Cables – such as 6491X, a single core, insulated PVC cable and 6242Y, a flat twin and earth cable have been developed to comply with British Standards and are matched to electrical power and control systems that we use for our every day lives. Power Cables – from Firetuf FTP120 and Saffire BS6724 armoured power cable to the general BS5467 cable, all Draka power cables have been developed to meet or surpass British Standards but always with the installer in mind. Draka is part of the Prysmian Group, a world leader in the energy and telecom cables industry, with more than 19,000 employees across many countries around the world. Draka is based at Eastleigh in Hampshire. Is this the ‘right’ move from Google? The PPC community has been out in full force in recent days after Google stopped serving paid text ads on the right hand side of its results page. Product listing ads (PLAs) still appear and a fourth ad has been included at the top of the page for premium phrases, pushing the organic rankings further down the page and giving the SEO community plenty to think about in the process. The most likely reason Google has made this decision is for economic gains – with CPCs forecasted to rise given that the top positions will become more desirable – and a push to make the desktop and mobile/tablet experience more seamless, which potentially coincides with the other big announcement that accelerated mobile pages (AMP) for HTML is now available. What does this mean for webmasters and agencies? The PPC landscape will likely become more competitive with a reduced amount of paid ads now showing in the prime real estate at the top of the page, and campaigns that have relied on the regular and cheaper traffic driven from positions 4-10 may start to see a drop off in click-through-rates, forcing a push into the more expensive premium positions. For websites that rely more on organic traffic there is the concern that the fourth paid ad position may eat into their share, while only the top three local positions now show by default, down from five previously, which could have an impact on smaller businesses. It may take a little time to notice any big changes, but In the short term you’ll need to keep a close eye on Google AdWords and analytics to assess the impacts and adjust bids of your top performing PPC keywords if conversion rates start to drop off. If increasing your bids to maintain the same conversion rate increases your cost-per-sale or cost-per-lead it might be time to weigh up putting more time, effort and money into obtaining a higher organic ranking. I’d recommend that you make sure important content is not hidden within ‘Click to Expand’ tabs or menus – especially on the Homepage. Important text needs to be visible all the time if you want to keep or improve your site/keyword ranking. Keyword research and placement continue to be hugely important in ranking success. But web writing that is engaging and search engine friendly isn’t always easy. Keyword research – everything begins with good keyword research. Know what terms you are targeting and their popularity. Connect your content with the keywords people type into a search engine. Research related topics and themes – examine the keywords related to the main target keyword. Use these related keyword phrases to build content around your main theme. Answer questions with your content – good content answers questions. As you structure your content around topics and themes, try asking and answering questions to provide a user experience better than the competition. Use natural language – during your keyword research identify other ways visitors refer to your topic, and include these in your content. We don’t need a computer to make our content better or easier to understand. If we write content that is engaging for humans it will go a long way in being optimised for search engines. Exact match and phrase match keywords are disappearing from Google AdWords. Google announced that these will be replaced with ‘variation’ or ‘near match’ varients starting in September. What does this mean and how will it affect your Google AdWords campaigns? In a blog post on 14th August Google announced that it will no longer be possible to bid on exact match and phrase match keywords without including ‘close varients’ – keywords that are similar to the entered keyword. According to Google nearly 10% of Google searches contain a misspelling, and there are other varients that need to be included. They give the example that if you advertise for the exact match keyword [kid scooters], Google will now show your advert for the search terms “kid scooters”, “kid’s scooter” and “kids scooters”. Until now, ‘exact match’ meant that the ad was only shown for “kid scooters” and not for the variations. A similar approach will effect phrase match keywords. The official Google statement is that this change is great and that you will get a lot more clicks. But as an advertiser you will have less control over your target keywords as it’s unclear whether the variation keywords will have the same conversion rate as the target keyword. The cynic in me says this change will be beneficial to Google but might not be beneficial to Google AdWords users. Unfortunately, there’s nothing users can do to prevent this change. You could change your phrase match keywords to exact match keywords so that Google can’t add too many unwanted additional keywords to your account. You can also use negative keywords to remove unwanted phrases, but this canbe a very long-winded process. As is often the case with Google updates we will have to wait and see what happens, assess the impact and make any necessary changes to keep our Adwords campaigns working efficiently. Customers like to see other people’s reviews for a product or service when searching online and Google have been adding reviews from third party sources for some time. However, now on Google Adwords it’s now possible to add a review extension to your advert and share positive write-ups, awards or third-party rankings with potential customers. This is in an additional line of text beneath your ads on Google Search and you can choose and enter your own quoted review. You can use a paraphrased or exact quote, as long as it’s attributed and linked to the published source. However Google also point out that it is your responsibility to make sure you’re allowed to use a third-party review for your ads, so you would need the publisher’s permission. Google has announced a major ranking algorithm update – Panda 4.0. The Panda algorithm targets websites with poor quality content and means that Google has probably changed how they identify low quality content. According to a number of reports on the web, major sites like ebay.com, ask.com, and biography.com have lost up to 70% of their Google rankings. It would seem that the content of these web pages (which is often automatically created) is not good enough for Google’s new ranking algorithm. Will this affect your website? If your website has a lot of very similar pages, it’s likely that it will be affected by this new algorithm. The same applies if the content of your pages has been created automatically. But if your site has good original content this update won’t do anything to your rankings. The basic rule applies, if you do not spam, you have nothing to fear. Twitter users follow brands and organisations for a variety of reasons – promotions, entertainment, exclusives, customer service, etc. So ‘Discounts & Promos’ and ‘Free Stuff’ lead the list but ‘Fun and Entertainment’ is also right up there. Knowing your followers is an important part of working successfully on Twitter but it’s always worth experimenting with different types of Tweets to see what works for your business, and what doesn’t. And this simple graph could help in deciding what to try. Google celebrated their 15th birthday recently with a press conference at the garage where the company was created. During the conference they explained that a month or so ago they switched their algorithm to handle “complex questions” even better. This new update is called ‘hummingbird’. Hummingbird’s primary focus is to boost the knowledge panel’s usefulness and answer ‘complex questions’. Because of this, it seems to have rolled out without much notice or fuss from website owners. What does Google mean by ‘complex questions’? A complex question means thinking less like a computer and lot more like a human and interacting with you on dynamically mobile devices that provide the ability for verbal search. The motivation behind this update is the same one that motivates most of Google’s updates – to answer the questions users are asking and maintain their top spot as the search engine of choice. understand the needs of your audience, how they are likely to communicate and the questions they might ask. include more question specific queries in your site content with natural language matches. re-write or expand detailed FAQs on your site. with mobile visitors set to outnumber desktop visitors, make sure your site is mobile friendly and responsive. add informative video content to your pages as a way to increase site traffic and insulate against the possible affects of Hummingbird. We who live on this small island can’t go too far without encountering the sea, and many of us have sailed the waters around the British Isles. Some take this further and yachting or boating become regular hobbies. But around our coasts are some of the most demanding seas in the world with changeable weather, large tides, strong currents, underwater obstacles and traffic, with the English Channel the busiest waterway in the world. So if you plan to go on the water it’s probably a very good idea to learn some sea and boat skills form the experts. This is where Adam Wilson and his team at Aquasafe Powerboat School can help. 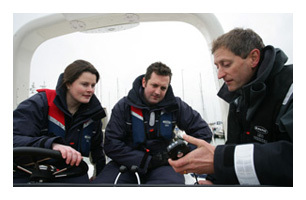 Aquasafe have changed hundreds of land lubbers into competent seamen through their RYA powerboat courses. These teach all the basic seamanship skills of how to handle a powerful boat in the tricky waters of the Solent and Isle of Wight. They are part practical and part theory so you learn as well as having a lot of fun. Courses can be one day for a basic qualification, up to two or more days for a powerboat level 2 course and they keep groups small so there is plenty of time to practice and learn the neccesary skills. Aquasafe have a great group of instructors – all commercial skippers as well as instructors, some a bit older with years of experience, and some younger, but all are at the top of their game. This is important because with a top speed of around 30 knots (35mph) and the ability to tackle big seas, a RIB powerboat in the wrong hands could be very dangerous. So it seems all the more amazing that a qualification isn’t compulsory – like the national driving test – but for the recreational user it isn’t. For the instructors it’s very different and School Principal, Adam Wilson, is both an RYA Yachtmaster Instructor and and RYA Advanced Powerboat Instructor. He is also a commercially endorsed Yachtmaster Ocean – for both power and sail. The RYA or Royal Yachting Association, set the standards for training across a range a yachts, motor boats and powerboats and Aquasafe are a fully approved RYA powerboat school. So if you are planning to go on the water, want to add a skill to your CV or just have some fun driving a fast powerboat a course at Aquasafe might be a good place to start.